Is poetry relevant to students in the twenty-first century? For Emily Buckley’s high school Creative Writing class, the answer is an emphatic “Yes!” In fact, these students believe poetry is important enough that they initiated a project that makes sure their classmates encounter great poetry all over Clever High School. “This project helped my students explore different types of poetry and poets. It exposed them to writing that they might have missed if I'd been assigning everything. They were able to pick poems that spoke to them and that they felt were worth sharing with their fellow students. It was really fun to see what they all chose!” said Mrs. Buckley. 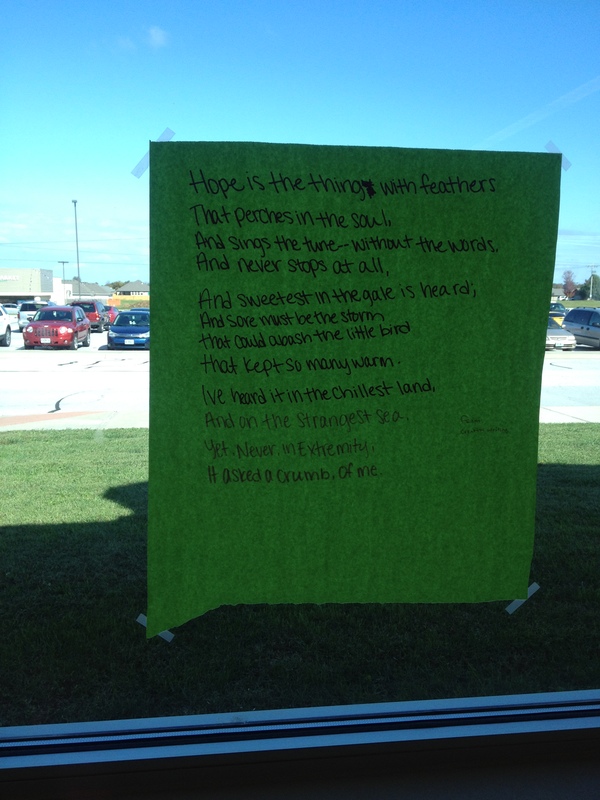 Since the first week of October, students and staff have found large, colorful pieces of paper covered in poetry popping up everywhere. Some of the poems are whimsical, others are profound, and a few are even sad. “One reason we did this is to encourage others to be brave, to be creative, and to make their own path, not just follow the footsteps of others,” explained Creative Writing student Derrick Nolan. This project was entirely student driven. In the course of a class discussion students expressed how much they wanted their classmates to do more than roll their eyes when encountering poetry. The students wanted to share poems they liked or thought were funny in a way that CHS students could hardly avoid, so they came up with a plan to post poems all over the building.Poems showed up in the office, on hallway walls, on classroom whiteboards, and especially on windows. The students chose poets like Emily Dickinson, Shel Silverstein, and U.S. Poet Laureate Billy Collins. Some of the poems were even composed by students. Taking advantage of this opportunity, Mrs. Buckley’s students created a way to share poetry throughout Clever High School. “We tried to pick poems that were motivational and would touch people,” said Cole.